Financial econometrics is an integral component of modern quantitative trading. Cutting edge systematic trading algorithms make extensive use of time-series analysis techniques for forecasting purposes. Thus, if you wish someday to become a skilled quantitative trader, it is necessary to have an extensive knowledge of econometrics. A subset of my econometrics collection! 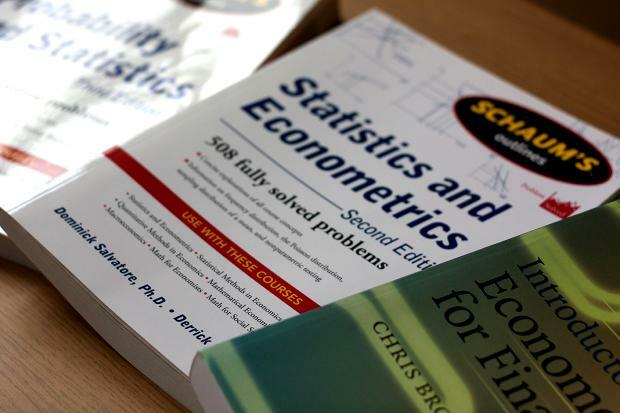 In this article I will list my favourite econometrics resources, beginning with an elementary statistical basis through to the current research literature. Please be aware that econometrics can be a tricky subject to grasp as it requires a substantial mathematical and statistical prerequisite base of knowledge. The best way to start is to make sure that you are familiar with the essential basic probability and stastical concepts. I'm a big fan of the Schaum's Outline series of books, as they always have a huge number of questions to work through. More importantly, these questions actually have worked solutions! I often find it helps to solidify concepts if one is actively practising the theory being described. One of my professors at university would continually remind us that "mathematics is not a spectator sport". I would say the same is true of learning econometrics. Although I only personally have the 3rd edition of this book, I can confidently say that it is extremely useful in brushing up on your undergraduate probability and statistics. The first part of the book begins with basic probability, random variables, probability distributions, expectation, correlation and ends with worked questions on special probability distributions. These distributions pop up everywhere within quant finance (normal, poisson, binomial, gamma, student's t etc), across derivatives pricing, risk management and quantitative trading. The statistics section is significantly larger containing seven chapters across a wide range of beginner statistical concepts. Sampling and estimation theory are considered first, then hypothesis testing. Regression, ANOVA and finally Bayesian Methods are considered. While the book is extremely comprehensive (it covers approximately two semesters of material), it does suffer from some typographical errors and is rather high level for a beginning course in statistics. It is a great supplement to a class or lecture series on the topic, however. Yet another good book from the Schaum's Outlines stable. Salvatore and Reagle initially cover similar ground to Spiegal above, but spend far less time on pure probability. The worked examples are excellent and the writing style is particularly engaging. After the first five chapters on statistics, estimation and hypothesis testing, the book gradually veers towards statistical methods as applied to econometrics. This includes simple and multiple regression, an essential tool in the econometricians toolbox. A brief chapter on time-series methods is provided, discussing Autoregressive Moving Average (ARMA), stationarity and cointegration. These tools form the basis of some of the modern quantitative trading algorithms. Note however that this book is not deep enough in econometrics to be read in isolation. It is really designed as a "bridge" between those who have taken an introductory probability/stats course and want to see slightly more challenging material. The main benefit, as with all Schaum's books, is that there are hundreds of worked examples. The book also includes a computational chapter on which the methods can be tested. At this stage you should have a good grasp of basic probabiltiy, statistical methods and exposure to the time-series concepts used in econometrics models. The next step is to get a grounding in economics modelling and how it can be applied to large data sets such as that arising from financial markets pricing data, which is the main domain of the quantitative trader. I'm going to list two introductory econometrics texts here. I want to emphasise that I don't suggest reading them both in their entirety as they cover similar ground between them. However, they do vary significantly in their style and the topics they tend to concentrate on. Thus I will describe each in turn and you can make your own mind up as to which one sounds right for you. I really like Chris Brooks' text and I would highly recommend it for any prospective quant trader. The book begins with an extensive set of chapters on linear regression, peppered with many examples related to financial markets that are highly applicable to quantitative finance work. The chapters progress from simple linear regression to multiple regression and then discuss the importances of the assumptions of such models. The next set of chapters concentrate on time-series analysis, including ARMA and Vector Autoregressive (VAR) models. Once again, there are plenty of examples related to quantitative finance, such as forecasting time series. Chapter 7 discusses long-run relationships and spends time considering cointegration, a useful tool for mean-reversion algorithmic trading strategies. Chapter 8 provides the first glimpse into the world of modelling volatility including an extensive discussion on the famous Generalised Autoregressive Conditional Heteroscedastic (GARCH) model. The book also has a chapter on Monte Carlo techniques, an area well known to long-term QuantStart readers. The main benefit of the book is that it is geared up towards students of finance, rather than those more interested in purer macroeconomic modelling. This econometrics text by Kennedy takes a slightly different tack from that by Brooks. It concentrates far less on the financial aspect of econometrics than Brooks, instead spending a significant amount of time on discussing when assumptions to certain models can be violated. This is extremely useful as it often quite easy to apply a certain technique to a situation when the assumptions do not actually hold. The book is not particularly heavy on mathematics (for that have a look at Greene, below) but it is far better at explanation. This is not a theorem-proof text! Its main strength is that it clearly elucidates complex econometric ideas and provides the rationale for why particular models are utilised. Other, more advanced books tend to gloss over these issues. Although it is not as highly relevant as Brooks' book to quantitative trading, it will certainly help clarify any issues you may have with certain econometric ideas. Others have also recommended Basic Econometrics by Gujarati and Porter. Unfortunately, I would like to recommend this book as well but it is currently sitting at $180 on Amazon.com! Despite the extremely high price tag, many people I know have learnt introductory econometrics from this book. Another text which crops up when discussing more theoretical aspects of econometrics is Econometric Analysis by Greene. If you would like a more mathematical or graduate level treatment of the subject, Greene is recommended. After having studied a text like Brooks' above, you will be well on your way to being skilled within basic econometric theory and time-series modelling. The next step is to start delving deeper into the statistical basis for the econometric theory, so that you are completely familiar with when to be able to apply a certain technique to a particular financial situation. We will now start to discuss more advanced material, including time-series modelling and the current state of the art in the econometrics research literature. I want to provide a bit of variety at this stage by suggesting that you take Eric Zivot's fantastic Financial Econometrics course at Coursera. I've mentioned this course a few times on QuantStart and in the mailing list. It is highly watchable and Professor Zivot works at a pace that is very manageable. The course is accessible to those with a basic probability and statistics background, but actually ventures into some relatively advanced material. The course begins with a great set of lectures on asset returns. While this is considered "bread and butter" content for quantitative finance, it is great to have it summarised in one place. The lectures then concentrate on univariate and bivariate statistical distributions. Time-series concepts are covered, as are descriptive statistics. Professor Zivot also brushes up on matrix algebra along the way. The latter half of the course is more directly applied to finance, with discussions on Monte Carlo modelling, bootstrapping, portfolio theory and risk budgeting. All in all, the course is a great way to learn some additional econometric ideas. Watching lectures makes a change from the late nights pouring through textbooks in the university library, too! You can simply watch the video lectures or you can actively take part in the homework assignments. I suggest the latter, as the ideas are really only fully grasped after trying them out in Excel or R, which are the two tools used in the course. Ruppert's book is extremely comprehensive in its treatment of financial data analysis. The book covers significant financial ground from basic asset returns through to GARCH, CAPM, Factor Models and Risk Management. The book is in fact the main recommended text for the Coursera course described above. Perhaps the main benefit of the book is that it provides numerous worked examples in the R language, which gives the book an extremely practical edge not seen in many other texts. However, it does not teach R from the ground up. For that you will need another book (such as A Beginner's Guide to R by Zuur). While it contains the "usual suspects" in an econometrics text (such as univariate and multivariate modelling, as well as time-series/forecasting), it also has chapters on Fixed Income Securities, Copulas and Resampling. If you have the time and inclination I suggest reading through the book in its entirety and carrying out all of the worked examples in R. This will give you a thorough grounding in modern econometrics and statistics as applied to financial datasets. At this stage you will have covered the necessary undergraduate material for financial econometrics. The following two books specialise in time-series analysis, which is the main area of application for a quantitative trader who works on financial pricing data. Both of these books are designed either for graduate students or practitioners. Firstly, I want to point out that this is quite an old book (almost 20 years, in fact!). Hence a lot of the current research literature has moved on. However, there is still plenty here which hasn't changed. Hamilton's book is geared up for the graduate level financial econometrician. It concentrates solely on time-series and so does not delve too deeply into simpler econometric theory. The book begins with ARMA processes and forecasting, then consideres spectral analysis and asymptotic distribution theory. Later chapters include Bayesian methods, Kalman Filters and Cointegration. So why should you pick this book up if you have already mastered the previous content? The main benefit lies in the depth of the book and the fact that it provides the "bridge" to more advanced research literature. In terms of audience, I would say that mathematicians will find the book relatively straightforward to progress through, whereas graduate economists might need to brush up on some of the mathematical prerequisites in order to make good progress. Tsay's book complements the one by Hamilton rather well. Despite the fact it has extensive converage of time-series methods, it is written primarily for the practitioner. The book also manages to discuss aspects of high-frequency trading (HFT), market microstructure, risk management (VaR) and the continuous-time Black-Scholes framework for derivatives pricing. The books spends a good deal of time considering non-linear time series and duration models, which is something not often considered in other works. The examples are carried out in the R language as well as S-PLUS, which makes it straightforward to implement some of the theory being discussed. This book is extremely useful for practising algorithmic traders as it contains the usual group of time-series methods, such as ARIMA and GARCH, but also considers the models from the point of view of the investor trying to build successful models. This is in contrast to Hamilton's book, which is very much designed for the graduate student. Once you have mastered the prior statistical and time-series based texts you will be ready to try your hand at the modern research literature. Depending upon your affiliation, you may or may not be able to access some of the top financial and econometric journals. However, that shouldn't stop you as many academics publish their papers directly to their websites and provide pre-print papers on popular research networks such as the Social Sciences Research Network or the arXiv. Pre-print servers, in my opinion, are one of the greatest uses of the internet to date. Having graduated from university it is tricky for me to obtain some of the latest papers out of journals. I won't digress into the politics of journal subscriptions, but I will say that SSRN and the arXiv computational finance section provide a great deal of interesting research material, much of it within financial econometrics. The drawback of sites such as the arXiv, is that they lack the rigour of peer review (by the very nature of the site! ), hence it can sometimes be harder to wade through the junk. This is why it is worth keeping on top of the literature via the journals, making use of the pre-print servers to access papers that you know are likely to be of high quality due to the individuals involved. The traditional academic community will be publishing in high quality journals. They are often a great source of ideas for statistical tools, as well as quantitative trading strategies. The peer review aspect will often ensure you are at least getting a reasonably reputable paper to read before committing the effort to doing so! Quantivitiy Twitter Feed - This contains a constantly updated set of great quant research papers, many in econometrics. The Whole Street - TWS provides a comprehensive "mashup" of various flavours of quant blogs, research papers and trading articles. Dig deep and you will likely find some fantastic articles. That concludes our foray into financial econometrics. In later articles I will be looking at individual techniques, especially some of the more advanced models used for algorithmic trading purposes.